Universal is a global engineer and manufacturer in acoustic, emission and filtration systems. Since 1959, Original Equipment Manufacturers, packagers and end-users in the industrial process, power generation, marine, oil & gas, locomotive and waste water markets have relied on Universal. Our systems portfolio includes a vast complement of silencers, catalysts and filters for blowers, vacuum pumps, vents / blow offs, diesel & gas engines, gas turbines and compressors. 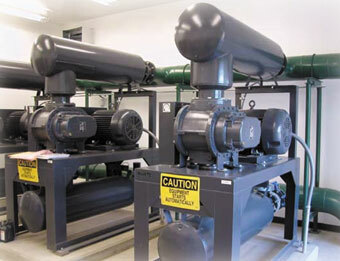 Universal is your expert in aeration systems for waste water treatment. Because waste water treatment operations are sometimes located in populated areas, noise treatment is important. By working with Universal for your acoustic needs, you are working with a company that has been in the business for over 50 years! Together we will develop a system that meets your local noise requirements that will stay within your budget. With a line of standard air intake silencers and filters and exhaust silencers for blowers, a cost effective solution is readily available. Our ability to tap into our global manufacturing operations allows us to provide quality, economical product. Also, by leveraging our experienced network of engineers and system experts, Universal is able to provide the right filtration and acoustic treatment systems to meet your needs while minimizing costs. Universal designs and manufactures acoustic, emission and filtration systems for oil and gas exploration, distribution and processing. Universal provides a single source supply for all air and exhaust needs, except the generator! Inlet air filtration and silencing, exhaust treatment and silencing, vent silencers, blower silencers, emission treatment systems including oxidation catalysts, selective catalytic response systems, diesel particulate filters and 3-Way catalysts are available from one supplier – Universal. Think of the efficiency gained and the reduced complexity by allowing the experts handle your oil or gas system. Superior product is critical to the success of oil and gas exploration, drilling and distribution. Turbines, engines and compressors are used by pipelines and distributors to move product or boost power from station to station. The ability to meet noise and emission requirements while achieving maximum production means relying on a key supplier. What challenges does this application hold? First, these stations generate a terrific amount of noise and emissions that can be hazardous and bothersome to workers or residents within the area. Second, environmentally adverse conditions, such as excessive dust or moisture, salt-water and heat create more issues where air filtration is at a premium. Universal also offers the widest range of engine silencers available on the market today. The offering includes spark arresting silencers, compact silencers and low pressure drop units. Universal is highly qualified in this market, through extensive experience using special materials, high heat designs and rugged paints and coatings. Universal produces acoustic, emission and filtration systems for natural gas turbines and diesel engines in stationary and portable power generation applications. Universal has a vast portfolio of successes with applications as small as 100 kilowatts to those as large as several hundred megawatts all around the globe. And it has custom-designed systems installed on all major turbine brands, including GE, Siemens-Westinghouse, Rolls-Royce, Pratt & Whitney and ABB. Universal rolls all of its experience into a one, smart, optimally designed and manufactured solution. Our customer base is continually challenging us to offer cost effective solutions. We believe this system approach will offer significant total cost of ownership saving opportunities with the latest technology available in the market. Universal manufactures a complete line of noise control and air filtration solutions for industrial processing, and has more than 50 years of experience fitting standard and custom-designed products to a wide range of industries. Pneumatic and air moving equipment, such as blowers, engines, pumps and compressors generate both high and low frequency noise in the workplace that can be both hazardous and irritating. Unfortunately, much of the automated processing equipment we rely on today has noise as a natural side effect; equipment noise is common to all industries, such as food and beverage, chemicals, material handling, paper, power, plastics, water treatment, rubber and consumer goods. Regardless of whether an industrial process application involves bulk handling, discharging gas, separation or simple ventilation, an inlet and discharge silencer must be designed to the application to effectively control noise. By identifying application specifics such as equipment type, size, speed, and application pressure and temperature, it is a relatively straightforward task to define an acoustic system in the form of chambered, absorptive or combination-type silencers to meet requirements. Whether your processing needs requires standard or custom silencing, emission treatment, or filtration, Universal is your single source design and production provider. And with business offices in the United States, United Kingdom, Germany, Singapore, and China, Universal is uniquely positioned to meet its customers’ global needs. Universal provides engineered acoustic, emission and filtration solutions for locomotives. Even with an expansive solutions portfolio of standard products, Universal is recognized around the globe for its customized solutions. Business offices in the United States, United Kingdom, Germany, Singapore, and China allow Universal to meet its customers’ global needs. In existence since 1959, Universal provides locomotive design engineers unparalleled technical expertise, integrity, customer service and high quality. A long working history with Electro-Motive Division (EMD) allows Universal a unique insight into locomotive needs, both past, present and future. With one eye on the locomotive markets’ needs and the other on its global capabilities, Universal is able to provide cost effective acoustic, emission and filtration system design and production. Since 1959, Universal has designed, manufactured and supervised the installation of thousands of gas turbine systems around the globe. Our expertise includes firsthand experience with major turbine brands, including General Electric, Kawasaki, Nuovu Pignone, Pratt & Whitney, Rolls-Royce, and Siemens-Westinghouse. World renowned, our resume includes turbine systems installed in locations such as Abu Dhabi, Venezuela, Brunei, and offshore platforms in the North Sea. Whether you are looking to replace a current turbine system or install a new turbine system, Universal has the expertise to help. The air and exhaust needs for a turbine are quite complex. Those needs are noise reduction, inlet air treatment, minimization of back pressure, management of temperature, optimization of flow, structural integrity, project management, logistics, and emissions treatment. With one eye on customer needs and the other on its global capabilities, Universal is able to provide cost effective turbine system design and production. Complete Systems or Components – Your Choice! A turbine generator is a substantial capital investment. Protection of the turbine generator starts with air filtration and ends with the exhaust system. However, there is a precious balance between air filtration, noise reduction, emissions treatment and turbine efficiency. With Universal, a qualified and experienced team of engineers and system experts are available to optimally balance your air filtration, acoustic treatment and turbine efficiency requirements. Universal has over 500 years of combined acoustic, filtration and emission experience from around the globe. We incorporate the latest software in design and manufacturing technology. If a standard product is not right for your application, we will design one! Universal also employs a Product Development Center to be on the cutting edge of the next technology breakthrough. What does this expertise give to your project? Is an absorptive silencer right for your application? The answer: it depends. That is why Universal is uniquely positioned in the industry, because we can take you through the process of selecting the right silencer for your needs. A global network of business offices and a large team of experienced acoustical system experts are at your disposal. The absorptive silencer is the classic dissipative design, obtaining its noise control properties from the basic fact that noise energy is effectively “absorbed” by various types of fibrous packing materials. More technically, as sound waves pass through the spaces between the tightly-packed small diameter fibers of the absorptive material, the resulting viscous friction dissipates the sound energy as small amounts of heat. Absorptive silencers are very effective on high noise frequencies (500-8,000 Hz). At frequencies above and below this range, attenuation performance progressively diminishes. Since noise is absorbed by the packing material, absorptive silencers do not rely on internal baffles, tubes or other restrictive devices to achieve noise reduction. Consequently, absorptive silencers generally employ a “straight-through” or similar internal designs which inflicts very little air flow restriction. Vent silencers are used in conjunction with systems that utilize a pressure relief valve. Typical applications for vent silencers are in oil and gas processing, industrial processing, chemical processing, heat recovery systems, and steam boilers. Universal’s vent silencers are used all over the globe on many applications. HV Series vent silencers effectively silence high-velocity air, steam, and gas vents and blowdowns to atmosphere where sonic or critical conditions exist in the valve. Typical applications include: steam boiler relief valves superheater header relief valves boiler startup and purge high-pressure air vents natural gas blowdowns switch valves compressor blowoffs autoclaves steam ejectors. Universal’s extensive in-house engineering, manufacturing, and testing facilities ensure an optimized process, mechanical and acoustic solution for any application. Vent and blowdown silencers are seldom a simple catalog selection. Usually, the purchaser provides detailed specifications and a system description that enables Universal to design a custom solution. An even easier way is to simply send the valve manufacturer’s data sheet for a vent to Universal and the experienced sales staff will recommend a silencer best suited for the application. Fans are found in many applications. A fan may be used in industrial, HVAC and processing functions. However, in any mechanical device requires components to rotate at high speeds, noise can become an issue. Throughout Universal’s 50 year history, they have added new products to their offering to address this age old problem. Primary air fans, forced draft fans and induced draft fans generally require some form of acoustical treatment. Most applications require inlet and/or outlet silencers to meet OSHA and other noise requirements. For continuous exposure, a maximum of 90 dBA is generally specified to avoid hearing damage. When conversation near the fan is desired, levels of 80 dBA and less are often needed. Separator-silencers are used to remove liquid from gas flow vacuum systems using either liquid-sealed rotary positive blowers or liquid ring vacuum pumps. Separator-silencers may be required for both the inlet (vacuum) and the discharge (atmospheric) of a vacuum system. Only the most stringent acoustical environments require significant inlet silencing. An inlet separator provides corrosion protection for the vacuum pump by removing most, if not all, of the process liquid before it enters the vacuum pump. The vacuum pump or blower discharge is normally extremely noisy and requires a high-performance separator-silencer. Universal brand exhaust silencers provide the most favorable performance for all applications by offering silencers crafted for four different attenuation grades. Due to the variability of different applications, performance levels are most accurately shown as broad range “expected attenuation bands,” which are based upon typical conditions. These bands will not define the exact insertion loss for a specific application, since insertion loss is influenced by engine size, type, speed and untreated noise levels. “Puck”-style silencers are low-profile silencers that not only fit in the smallest enclosures, but are also ideal for portable power, marine, or other applications where a “tight fit” is a concern. The single inlet models are available in residential, critical and hospital attenuation grades. Critical and hospital models also offer a low skin temperature (LST) design for exceptionally small compartments and enclosures to keep radiant heat to a minimum. The LST configuration incorporates an extra layer of packed acoustic/thermal insulation that reduces heat and noise, eliminating the need for expensive external wraps. The aluminized steel designs far outperform the comparably priced carbon steel competition by offering higher corrosion resistance, greater maximum operating temperatures, less weight and an overall longer silencer life. Puck silencers are available in single-inlet, and four types of duel inlet models.